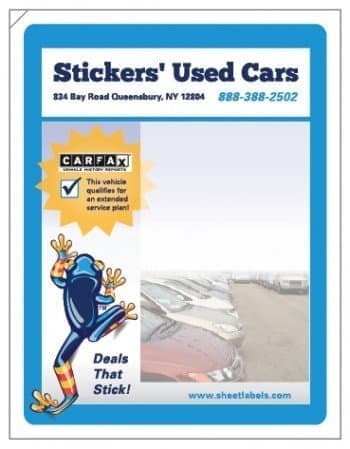 SLWIN™ auto window stickers from SheetLabels.com are specifically designed for automobile windows. Upload a current printed label design file or have our creative department design custom printed auto window stickers for your dealership! If you prefer, we also offers blank auto window stickers for your convenience as well. Enhance your inventory with dynamic graphics and logos on your windows from SheetLabels.com!